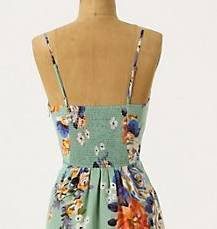 Since we're in the middle of the shirring series, how about a shirred-back Anthropologie dress? This is their Verdant Slip Dress. 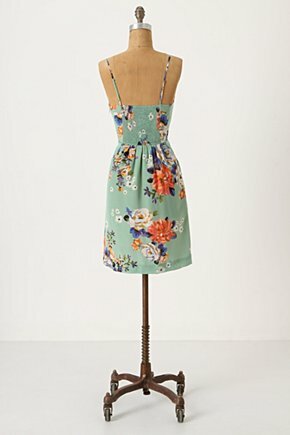 Oddly, Anthropologie always refers to shirring as "smocking." I don't think heirloom seamstresses would appreciate that! 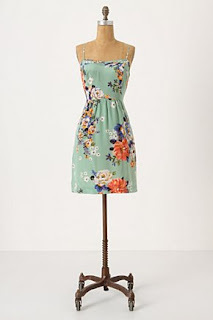 This is such a pretty print, don't you think? I love those big clusters of flowers. But let's talk about what's important here: the shirring. The back has a panel of shirring and the skirt below has lovely soft pleats. I'm kind of dying to check out the construction of this dress. Has anyone tried it on? Or better yet, own it? I especially want to know how they elasticized the skirt below the shirred panel. I'll be in Rockefeller Center today; I might need to take an Anthro trip! It could be my imagination but there does seem to be a zipper on the left hand side of the dress. that would explain the non elasticized waist-band. I could be wrong though! Yes, it does look like there could be a zipper on the side as Aphra said. Beautiful dress though. Although I love your red rose dress much better! Ooooh, aaaaah. Pretty. Vintagey colors. I like the perfect little square of shirring. It might be interesting to compare the fit of a fully-shirred back to the little piece on the verdant dress. It seems to me that your version with the shirring all the way across would be more comfortable and prevent odd wrinkling on the side panels. Thanks for the continuing tutes - I've almost got up the courage to deal with the elastic thread! Good thoughts everyone! Even though it does have a zipper, I would imagine the skirt panel still stretches with the shirred panel. I don't think the skirt panel is cut in one with shirred panel because it would be pleated separately. My two cents! Lovely, I think you should go try it on bc I want to know how they did it too. Probably a side zip but I'd still like to know and I have to drive 30 min and take a 8yo and 3yo with me to go to Anthro which falls into the please just kill me now category. You can tell that the shirred top and skirt panel are separate pieces because the print is doesn't match at the seam line. If you go to the Anthro site and mouse over the back waist area, you'll see little puckers across the top of the skirt. Maybe they: shirred the top panel, basted in the pleats on the lower panel, then stretched the shirred panel just a touch while stitching them together. I love playing sewing detective! Friend's daughter had a 'budget' dress of this style and couldn't get it on or off. I put a side zip in for her. It cost her more than the original price of the dress! But what I really want to know is: where the heck does one find their fabulous print fabrics?? I love the vintage-y boho type prints they have and I very rarely see similar things for sale. Or maybe it's a failure on my part to visualize how certain fabrics take on a different character depending how they're made up? This may be a stupid question then, but what's smocking? I've also always called shirring smocking and just assumed it was another regional variance from one side of the pond to another, is that wrong? you manipulate the fabric to form a pattern. Shirring uses elastic and is a technique to gather a lot of fabric into a short area. Thank you so much for the shirring tutorials! I have a Vogue Dress I made last year with elastic in the middle of the back and I love the look and fit - great waist definition, but very comfortable. I am sure shirring would accomplish the same thing and look better! Also, as one of those heirloom sewists, thank you for calling it "shirring" and not "smocking" even if anthro doesn't know better. OK, if we're on stupid questions, here's mine: What is the difference between Heirloom and Couture sewing? I know what Heirloom is... smocking, lace inserts, etc. I've always just wondered about why the separation between the two fine sewing techniques. Does courture use heirloom techniques ever and vice versa? @Tors - I'm a brit and I would use smocking to describe what the americans call shirring. Using thread, whether elastic or not, to gather up fabric in rows will always be called smocking to me. However, slightly bizarrely, to me the thread used for smocking will always be called shirring elastic because that's what my mum called it. She would make me a smocked dress using shirring elastic. I have spent most of my life up until your first post on the shirred-back dress thinking of shirring as smocking and what is properly called smocking as hand smocking. I actually spent some time on google trying to find tutorials on shirring a few years ago for the purpose of making sundresses. No wonder I didn't find anything. Thanks for clearing that up! SMOCKING is the application of embroidery stitches to a finely pleated panel of fabric. The stitches are decorative and most provide elasticity although certain stitches are specifically for a non stretch situation.